We have had an exceptionally busy season once again with the 11 Nike Futures Tour Championships for our Under 12 and Under 14 players proving immensely popular. Over the Winter we will take a look at what we might be able to do for the boys who have to drop out of this Tour as they are too old. We may look at adding an Under 16 category into the fixture list. The Orders of Merit for these Championships and the ones for the Men and Juniors will all go down to the last event before we know who will win. Once again, I’m afraid I have to report a lack of success in all three South East Group Qualifiers, we led in all 3 in the morning but failed to turn any of them into a win. To say we were distraught would be an understatement. We lost narrowly to Hertfordshire in the Seniors League and have to settle for 2nd place in the table again. Next year we think we have 2 new scratch players joining the Seniors ranks and we are confident that we may be able to get the better of Hertfordshire next year. The good news is that we have already won the 1st Team League as we have won all 3 of our matches by a wide margin and regardless of the result in the final match we can’t be caught. We will play in the Final at Brocket Hall on 6th October. 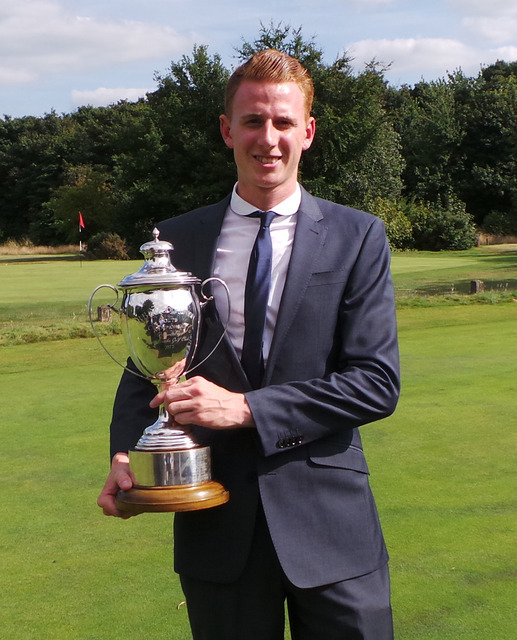 Well done to all the players mentioned in these Jottings, especially to Tom Lawson (Stoke Park) who won the Amateur Championship at his home course on 10th August. 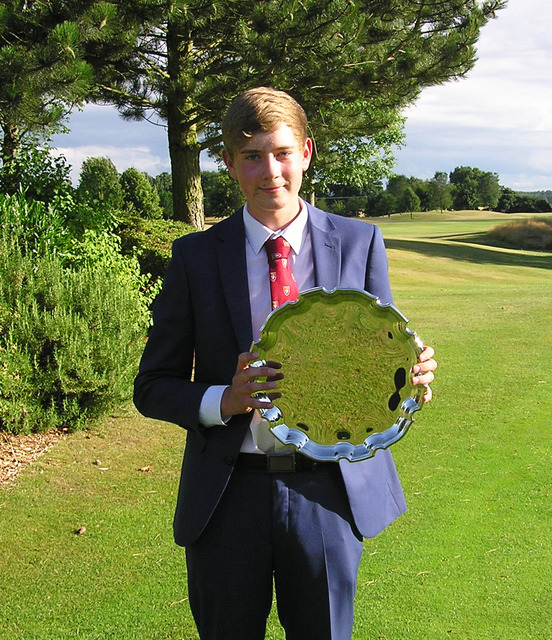 He will join Phil Sewell (Castle Royle) Seniors’ Champion and Michael East (Castle Royle) Junior Champion at Woodhall Spa in September as they vie for the Champion of Champions crown in their respective age groups against the County Champions from all the other Counties. Team at Essex: James Foster (Newbury & Crookham), Jack Haines (Buckinghamshire), Stephen Jensen (Woburn), David Langley (Castle Royle), Malcolm Reid (Sonning), Andy Taylor (Woburn), Ashley Walton (Frilford Heath), Sam Whitehead (Woburn). 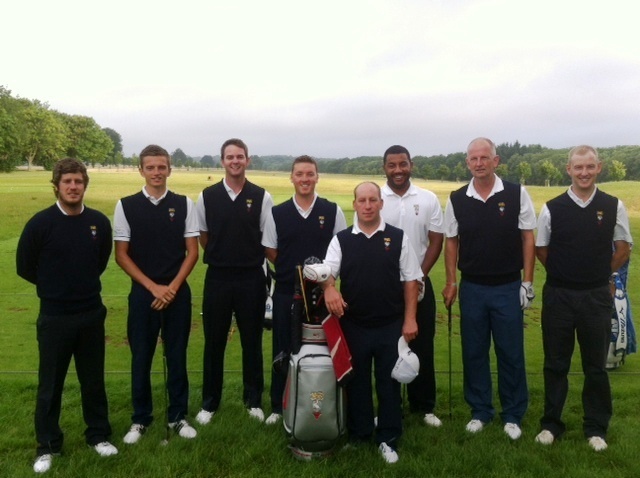 Our next League match was against Bedfordshire at Luton Hoo on 7th July. The hottest day of the year was matched by a BB&O team looking for a second win from two, to position them with a good chance of winning the League. Event clashes meant that both teams struggled to get regular players out, but the depth of BB&O talent meant that a strong side could still be fielded. Getting an away result is never easy but the team were very determined and opened up with a great 4-0 lead from the foursomes and followed in the same vein in the afternoon to run out convincing winners 11½ to ½. Many thanks to late call ups, Chris Little and Dean Newbold both picking up full points. Team at Luton Hoo: Carl Corbin (Stoke Park), James Foster (Newbury & Crookham), Chris Little (Frilford Heath), Dean Newbold (Frilford Heath), Malcolm Reid (Sonning), Andy Taylor (Woburn), Ashley Walton (Frilford Heath), George Wilson (Calcot Park). We were back at Heythrop Park for our League match against Hertfordshire on the 4th August. On an unseasonably cold and wet day the BB&O played hosts to Hertfordshire. The home side got off to a great start taking the morning foursomes by a margin of 3-1. This included a resounding 5&4 win by the by the more senior members of the side Malcolm and Ashley! Hertfordshire came out strongly in the afternoon singles and took early leads in most of the games - by 9 holes the home side were starting to wonder where the winning points might come from; but impressive golf saw matches turn in our favour and having lost the first single, we took the next 4 to secure a victory. This was followed by the experienced men at the back Ashley & Malcolm picking up a further 2 points making the overall win 9-3. All players on the day picked up at least one point - all contributing to the resounding win. This third victory in 3 gave the BB&O 30 game points out of a possible 36 an almost unassailable total which has possibly secured the League title. Team at Heythrop Park: Carl Corbin (Stoke Park), Dean Newbold (Frilford Heath), Malcolm Reid (Sonning), Nick Scrutton (Castle Royle), Andy Taylor (Woburn), Ashley Walton (Frilford Heath), Sam Whitehead (Woburn), Tom Wilde (Castle Royle). The Elite Juniors and their opponents Hertfordshire were lucky to have the chance to play at Woburn on 11th May where the boys played the Marquess course for the morning foursomes and the intimidating Duchess course for the afternoon singles matches. Both course were in excellent condition, looked fabulous and the Club’s staff were very helpful and welcoming. Sadly the weather brought both Winter and Autumn conditions back with blustery winds making play challenging throughout the day. Although it was dry in the morning the temperature appeared to stay in single figures and it became colder as the day went on. A prolonged downpour during the lunch interval left many areas of the course including greens with casual water. Later in the day, there were more heavy showers interspersed with hail, thunder and lightning which particularly affected the conditions for the last four groups. Hertfordshire has always been a good side to beat and this year their best team arrived unbeaten for our annual encounter. BB&O won the foursomes 4-1 and in the afternoon increased their lead to give us an overall 11-4 victory. Team at Woburn: Patrick Bart (Burnham Beeches), Alex Buckner (Bearwood Lakes), Zac Cooper (Beaconsfield), Michael East (Castle Royle), George Gardner (Castle Royle), Chris Little (Frilford Heath), Louie Moore (Beaconsfield), Alex Nicholls (Goring & Streatley), Tim Shin (Castle Royle), Elliot Wills (Beaconsfield). The U16’s showed an immense amount of character in securing wins over both Hertfordshire and Middlesex in the League match at Hendon Golf Club on 6th August. 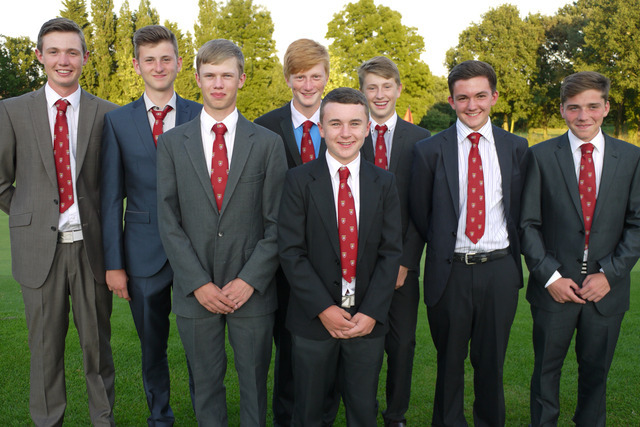 Coming the day after a rain drenched Junior Championship at Buckinghamshire, which 7 of the 8 man team had attended, the boys showed great mental strength, particularly during the afternoon singles to overcome a strong Hertfordshire team. The 3½ points needed from the afternoon singles against Hertfordshire to secure overall victory looked improbable with 7 of the 8 matches behind after 9 holes. Several boys mounted astonishing fight backs, from 3 or 4 down with 8 holes to play, to secure vital points. Damien Hewitt, Michael East and Elliot Wills all secured halved matches having been 4 down at some point during their respective matches. A special mention for Robin Sullivan, Josh Davies, Damien Hewitt and George Gardner. Robin secured all 4 points on his debut while Josh Davies, also making his debut, won 3½ out of 4. Damien Hewitt, the last debutant, was undefeated on the day. George Gardner Captained the team for the day and led by example securing all 4 points in some style. Despite the margin of victory against Middlesex their team should be applauded for pushing 5 of the matches in the afternoon singles to the 17th hole. They showed great resilience when competing against much lower handicapped opponents. 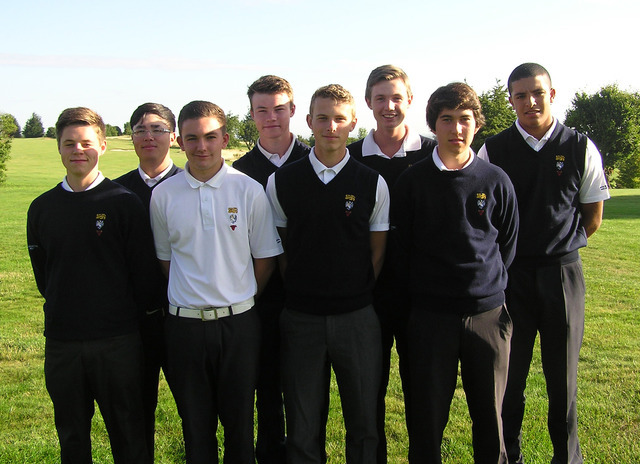 The team at Hendon: Zac Cooper (Beaconsfield), Josh Davies (Frilford Heath), Michael East (Castle Royle), George Gardner (Castle Royle), John Gough (Stoke Park), Damien Hewitt (Castle Royle), Robin Sullivan (Castle Royle), Elliot Wills (Beaconsfield). The Under 14 team had a mixed result against Hampshire and Wiltshire at Upavon Golf Club on Thursday August 8th in a friendly match. 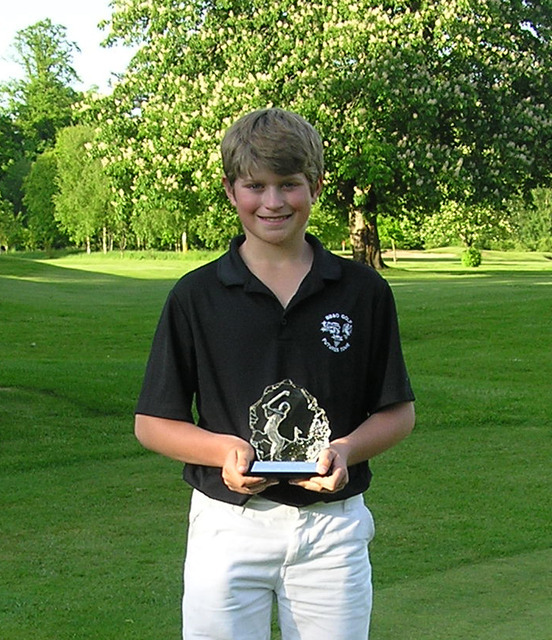 Slightly weakened by the loss of four boys to the Reid Trophy, the team also included Under 13s and 10 year old Conor Gough (Stoke Park) who earned his place in the team on the basis of his 8 handicap. Last minute injuries to two boys reduced the team from 10 to 8 so in both matches we started two points down. By the end of the match, BB&O had beaten Wiltshire 6-4 and lost to Hampshire by the same margin. Hampshire also beat Wiltshire. The Under 14 team had an indifferent day at The Hertfordshire on August 12th in our second League match. Although we comfortably beat Bedfordshire 12-3 we were heavily beaten by Hertfordshire 10½-4½. The triangular match consisted of 9 holes of foursomes followed by 18 holes of singles. Our Under 12 and Under 13 team were beaten in a friendly match at Sunningdale Ladies on July 21st. In great golfing conditions on a great golf course, our six boy Under 13 team went down 2-1 while our 14 strong Under 12 team was beaten 5-2. The format was Fourball Betterball with a points system to make it more interesting over the day. Pairs were awarded 1 point for the front 9, 1 one for the back 9 and 2 points for an overall win with the final result being Under 13s Surrey 7½ BB&O 4½ Under 12s Surrey 17½ BB&O 10½. The ten boy Under 12 and Under 13 team had a very successful afternoon in scorching heat at Aylesbury Vale on Sunday July 7th. Led in fine style by Captain Conor Gough (Stoke Park) the boys beat both Bedfordshire and Hertfordshire to record a notable double win. BB&O beat Hertfordshire 12-8 and Bedfordshire 15-5 with maximum points from Conor Gough, Harrison Arnold, Gregor McKenzie, James Gregory and Sebastian Tannum-Donaldson. Round 4 of the Nike Futures Tour took us to Hadden Hill on 31st May. A tough course in breezy conditions made scoring quite difficult, especially with some heavy rough in a number of areas. With John and Conor Gough away in Scotland it was good time to pick up some points in the OOM and Nick Elmey (Drayton Park) won the Under 14 section and James Gregory (Stoke Park) the Under 12s section. We had our 5th event at Badgemore Park on Sunday 2nd June. On a lovely day, overall scoring was good with Melan Dhaubhandel (Calcot Park) recording a brilliant 12 under 57 to win the handicap section of the Under 12s. Oliver Huggins (Carswell) secured his first win, in the Under 14s, with an excellent 73 just edging out Seb Jones (Castle Royle) and Steven Stanhope (Frilford Heath) who both posted 75s. 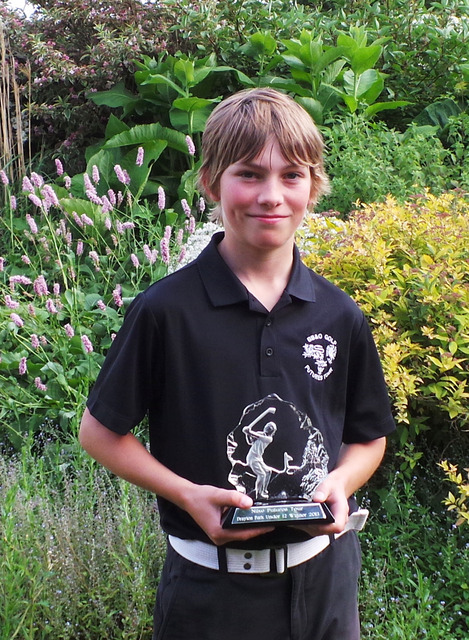 In the Under 12s, Gregor McKenzie (Kirtlington), emulated Oliver's maiden win with his 77 and was 5 ahead of Sebastian Tannum-Donaldson (Stoke Park). On a windy day at Drayton Park the 6th round of the Nike Futures Tour was played on 23rd June. With high winds, deep rough and tree lined fairways this was a real test for the boys. Remarkably, the Under 12s produced the best 2 scores of the day and Sebastian Tannum-Donaldson (Stoke Park) led with a 78 just 1 shot ahead of Daniel Stafford (Castle Royle). 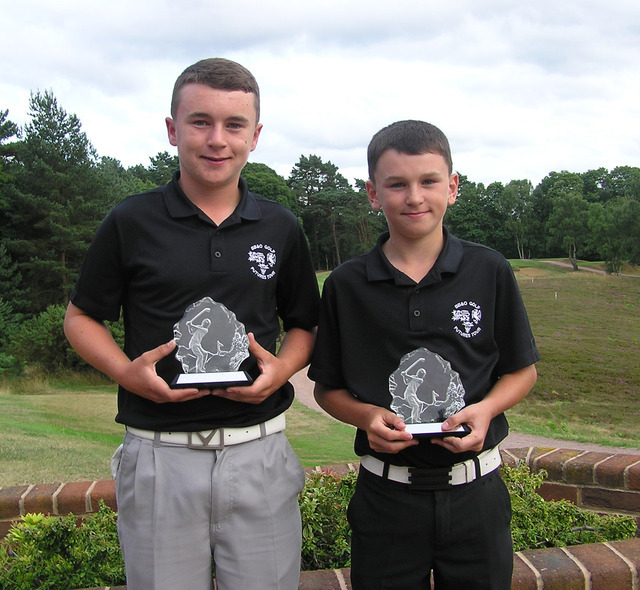 In the Under 14s Olly Huggins (Frilford Heath) scored his second consecutive win with Steven Stanhope (Frilford Heath) 2 shots further back. The Gough brothers dominated the 7th Nike Futures Tour event at Goring & Streatley on 31st July with both John and Conor winning their respective age groups. 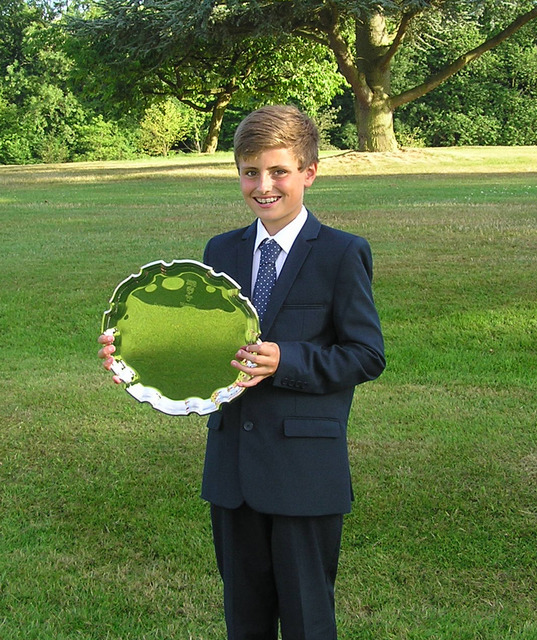 John scored an excellent level par round of 71 to win the Under 14s age group by 2 shots from Aaron Sidell (Sonning).It would be very interesting to know how many 14 year olds who are just 5 feet 2 inches tall could drive the 18th at Goring & Streatley! 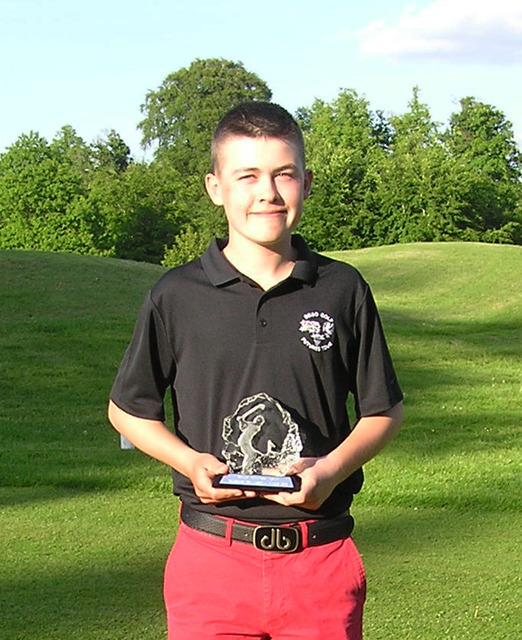 Meanwhile younger brother Conor also had a good day scoring 76 and finishing 2 clear of club mate Matthew Admans. Wins again for John and Conor Gough (Stoke Park) at The Berkshire in the Under 14 and Under 12 sections of the Nike Futures Tour Round 8 on 4th August. We played Gross Stableford in this event as some of the younger players would find it very tough to complete a Medal round given the extensive heather around the course. Similarly the organisers don't want to be there all night either! John had a very good gross 34 points to win the Under 14s but was only one ahead of Nick Elmey (Drayton Park) with Bradley Tuckett (East Berkshire) scoring 32 gross points off 10 handicap. 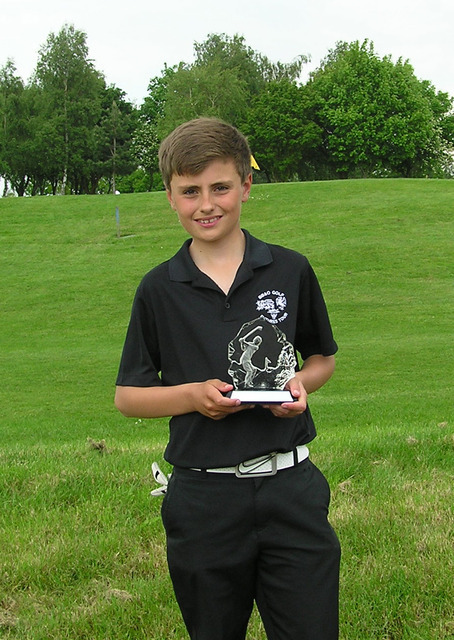 In the Under 12s Conor won with 31 points gross having edged out Sebastian Tannum-Donaldson on count back. Gregor McKenzie (Kirtlington) was a further point back. 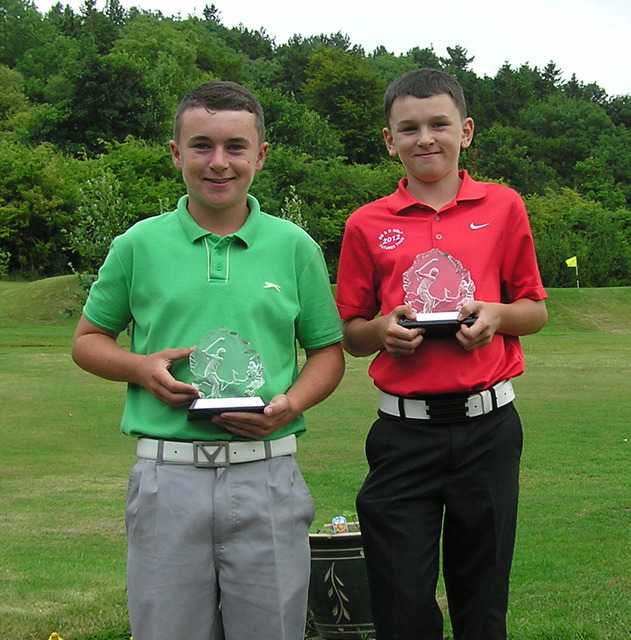 More success for John and Conor Gough (Stoke Park) at Hazlemere in the Under 14 and Under 12 sections of the Nike Futures Tour Round 10 on 14th. August as they post their third double of the season. John had a solid 73 despite a triple bogey at the short 15th winning by 1 shot from Stanley Lewis (Chartridge Park) and Conor enjoyed a similar margin over Daniel Stafford (Castle Royle) after his 78. Now that we have played 10 events of the Nike Futures Tour, the Order of Merit tables have started to change as Players' worst placings start to drop off. The Under 14 Order of Merit could be decided at Henley on 29th August but the Under 12 title will definitely not be decided until Frilford Heath at the end of October. 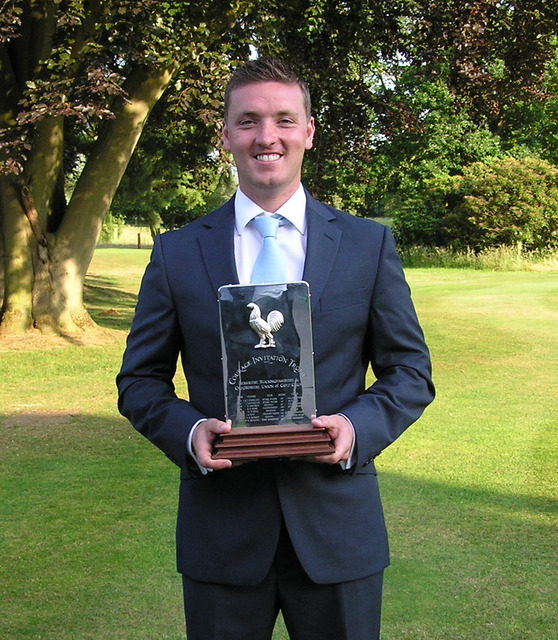 The inaugural Spring Trophy was held at Temple Golf Club on 6th May was won by Michael Verity (Burnham Beeches). George Bell was just one shot behind on 71. 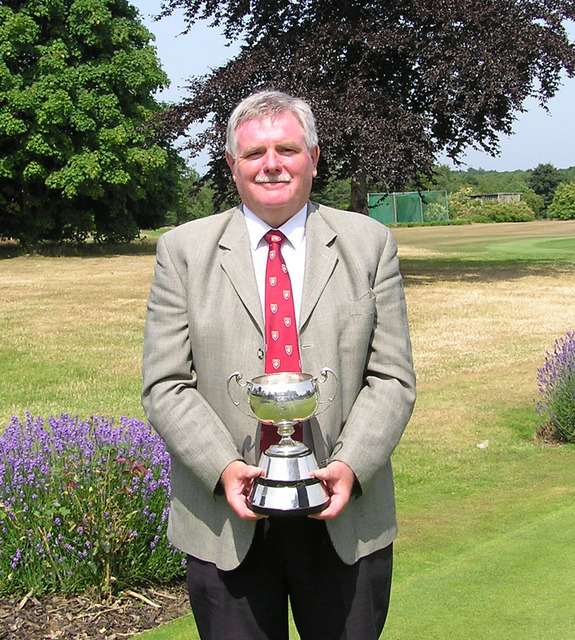 Phil Sewell (Castle Royle) won the Seniors Championship at Burnham Beeches on 12th July by 6 shots from David Niven (Newbury & Crookham) with Adrian Donkersley (Gerrards Cross) in third place. 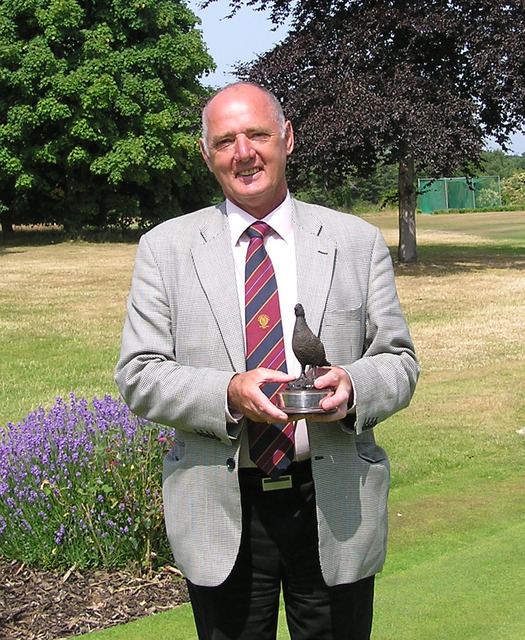 Maidenhead won the Team event and Bill Perkins (Maidenhead) won the Handicap prize and equalled his age on the second day. 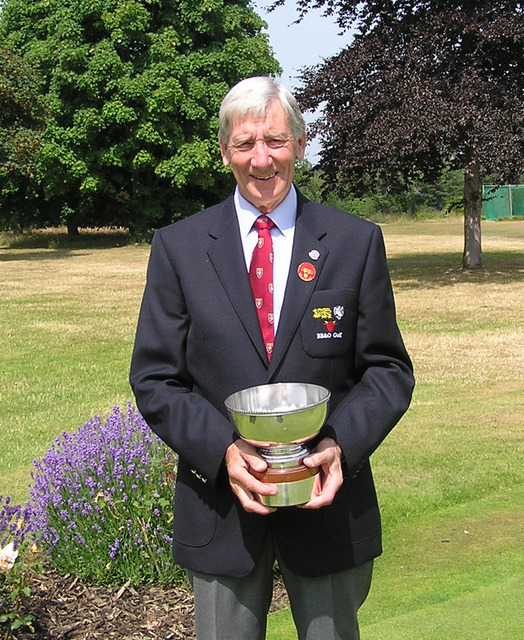 Phil also won the Under 60 Trophy, Neil Franklin (Beaconsfield) the 60-64 Age Group, Derek Harrison (Maidenhead) the 65-69 Age Group and Rod Crisp (Ellesborough) the Over 70s Age Group. Burnham Beeches was in excellent condition with fast and true greens and everyone enjoyed the Championship. What a pity we did not have a full field. Those who weren't there missed a real treat. 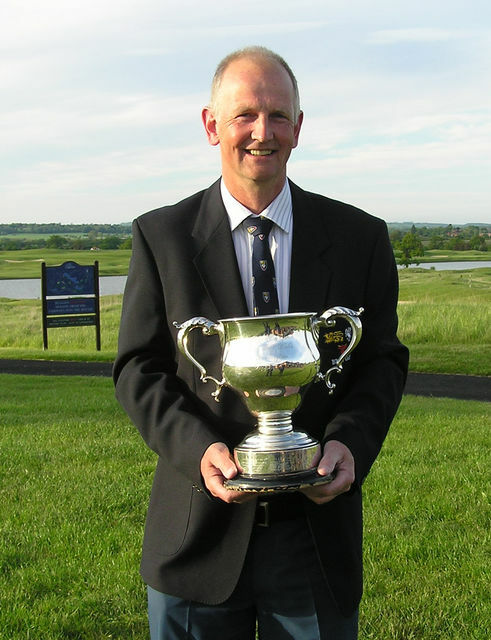 Malcolm Reid (Sonning) just held off the defending Champion, Carl Corbin (Wokefield Park), to win the Mid Age Championship at The Oxfordshire on 27th May. In difficult windy conditions nobody was able to break the strict par of 72. However Reid's excellent 73 in the morning gave him a one shot lead over Peter Clements (Frilford Heath) and 2 over Nick Adby (Goring & Streatley). A steady 77 in the afternoon just got him home as Corbin fired a 73 to post the early clubhouse lead at 151. 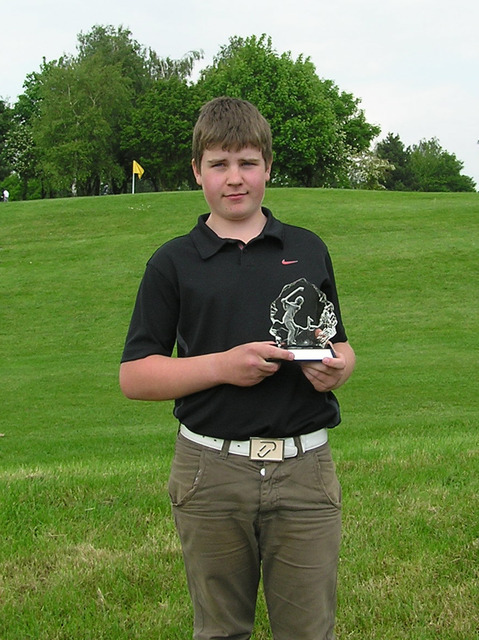 Toby Morgan (Frilford Heath) won the Colts' Championship at Huntercombe on 20th August. As the first attempt had been abandoned because of torrential rain in May, Huntercombe kindly invited us back to finish the job. The replay of the Championship was decided over 18 holes with Toby scoring an excellent 69 which give him 3 shot margin over 4 others. 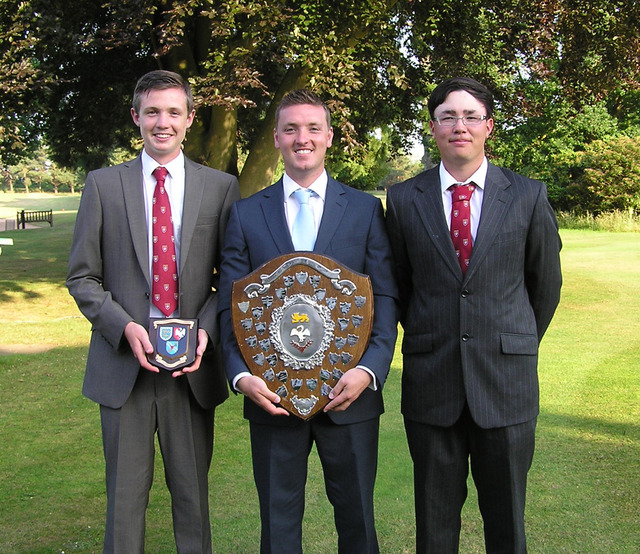 His fellow Frilford Heath members, Jordan Williams and Dean Newbold took 2nd and 3rd places. 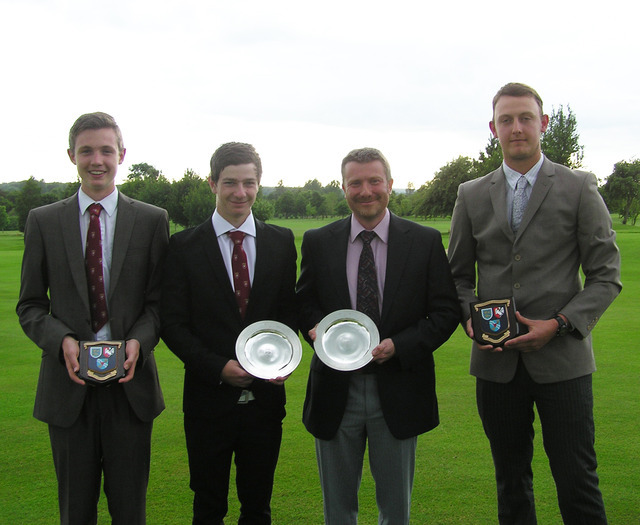 Ellesborough won the Club Scratch and Castle Royle won the Club Handicap Foursomes Championship at The Wychwood Golf Club on Monday 24th June. Clubs may enter 2 teams and each team can win either or both Championships. The Team of Luke Richardson and Phil Cuthbert of Ellesborough won the Scratch Foursomes by 1 shot from the Calcot Park pair of George Wilson and Shane Slatter with two excellent rounds of 76 and 74. Timothy Shin and Damien Hewitt from Castle Royle were a further shot back in 3rd place but the Club were not to be disappointed, as their other pairing of George Gardner and Sam Brass added to the Club's growing collection of BB&O Club Championship titles with a win in the Handicap section. Their score of 145 was 1 shot ahead of Lee Pearce and Robert Aitken from Reading. Two shots further back were the Denham pair of Will Kendall and Simon Stephens who also recorded the best round of the day with a level par 72 on a 6,938 yard course in the hardest format of golf known to man - 36 Foursomes Medal - a real test of endurance and friendship. Nick Scrutton, Tim Shin and George Gardner represented Castle Royle as they won their 3rd Champion Club title in 4 years at Frilford Heath on Saturday 6th July. A close run contest saw them just get the better of Stoke Park by 4 shots and we wish them well in the Final at Dudsbury at the end of September as they attempt to become England Champion Club. 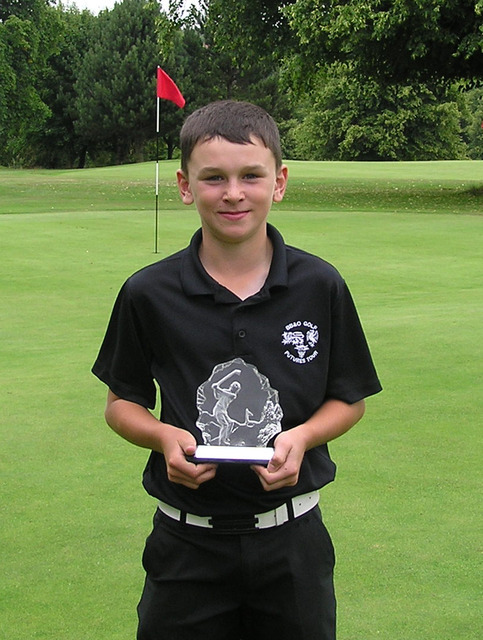 James Gregory (Stoke Park) won the Under 12s Championship by 1 shot from Harry West (Calcot Park) and Conor Gough (Stoke Park) at Beaconsfield on 25th July. His win consolidates his position at the top of the Nike Futures Tour Order of Merit. He has a 20 point lead over Sebastian Tannum-Donaldson with Gregor McKenzie in 3rd and Thomas Gregory in 4th spot. 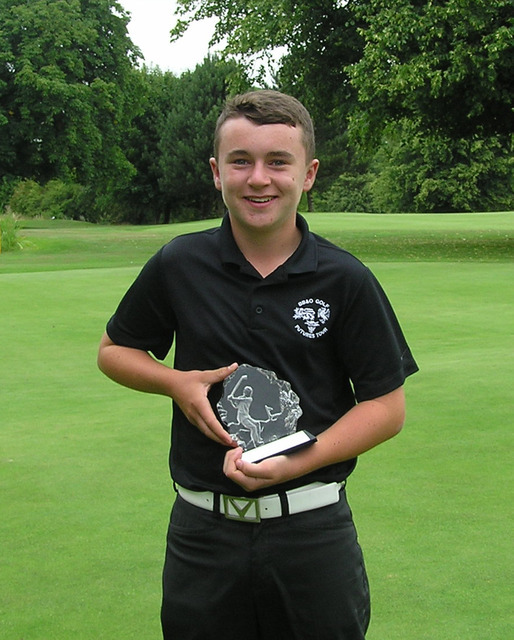 Steven Stanhope (Frilford Heath) won the Under 14s Championship at Castle Royle on 30th July with a great round of 2 under par 70. Despite starting in heavy rain, he made light work of the conditions to post the best ever score in this Championship. Mind you he was not alone in scoring well and he only finished 3 shots clear of Max Stradling (Goring & Streatley) and by another shot from Ross Hampshire (The Oxfordshire). In the handicap prize section Jack Kennedy (Wexham Park) took the honours with James Gregory (Stoke Park) and Jak Theyer (Newbury & Crookham) in 2nd & 3rd after fine rounds of net 68. 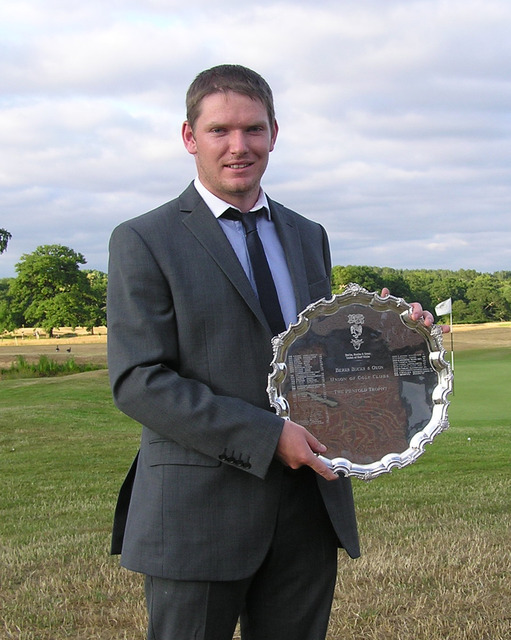 The Penfold Trophy was played at Royal Ascot Golf Club on Saturday 20th July. This event also serves as the qualifying round for the BB&O Amateur Championship and the top 48 players and ties gain automatic entry to the Amateur and the next 60 play in the Penfold Trophy for the remaining 24 spaces. Daniel Scourfield (Bicester) was the winner with a 2 under par score of 138 and he was 2 clear of Rory Browne (Feldon Valley) and 3 clear of Daniel Tucker (Flackwell Heath). There were 21 other Qualifiers for the Amateur Championship at Stoke Park on 9th & 10th August and the cut fell at 150. 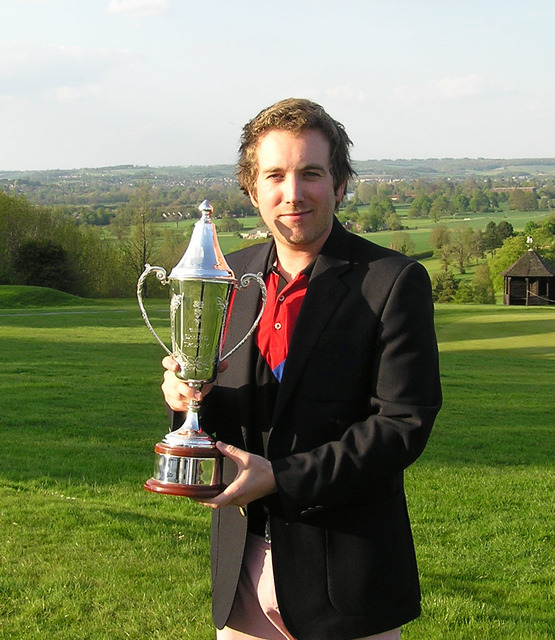 Marco Penge (Worthing) showed great form in winning the Douglas Johns Trophy at Harewood Downs on 1st August. A very strong field from afar afield as Yorkshire and Devon came to challenge for the unofficial England Under 15s Championship. Justin Rose, recent US Open Champion, won this event in 1995 and many other future International stars, including Luke Donald, have played in this event. 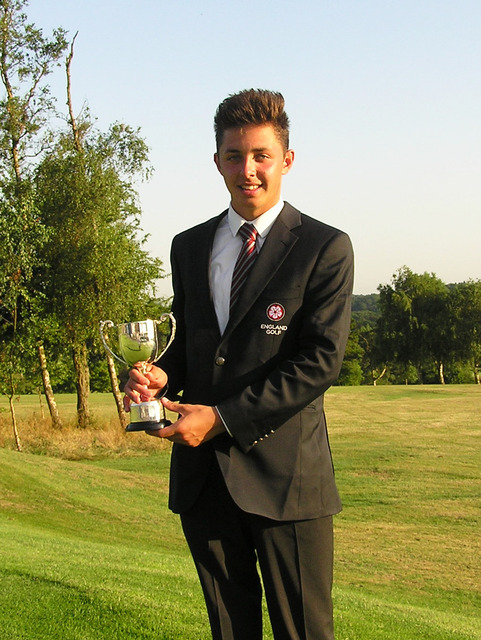 Marco has just been selected for England to play in the Boys Home Internationals and was the lowest handicap of plus 3 on the day. His opening round of 4 under par proved why he was favourite, but at lunchtime he held just a 1 shot lead from Alex Fitzpatrick (Hallamshire) younger brother of Matthew, who won the Silver Medal in The Open Championship at Muirfield in July. Arrun Singh Brar (Brokenhurst) and the defending Champion was also under par after a round of 68. The afternoon was extremely hot and a strong breeze had developed which made scoring quite difficult and one or two players tired. Nonetheless 3 players beat par and Callum Hilton (Warren) posted the clubhouse lead at level par just before Alex and Arrun tied at 1 under. In the last group Marco birdied the 17th to go 1 under for the afternoon and held a 4 shot lead coming down the last. His second shot cleared the green to the surprise of all the spectators, but the golfing gods were smiling, and he got a good lie and managed to make a bogey and still win by 3 shots. 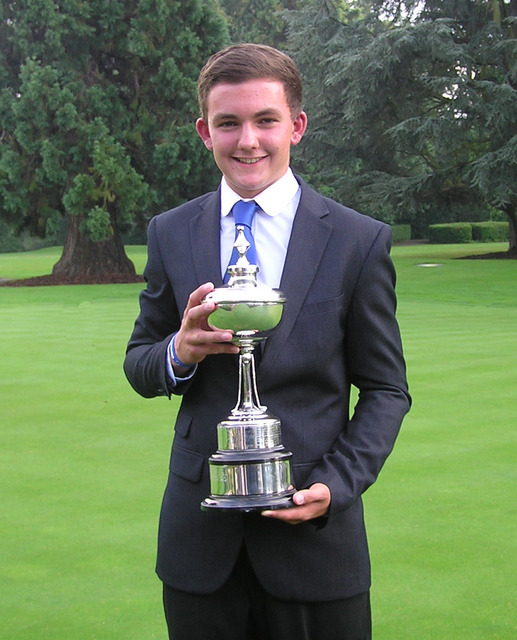 Michael East (Castle Royle) won the Junior Championship by 2 shots from Tom Butterworth (Harewood Downs) at Buckinghamshire Golf Club on Monday 5th August. His 2 under par morning round was the best of the day and he followed it up with an impressive 74 in the afternoon in the torrential rain, nearly resulting in the second round being abandoned if the rain had continued for another 30 minutes or so. Tom needed a birdie at the last to tie and knowing what was needed, hit a brave second shot into the par 5 last, which unfortunately found the greenside water hazard and he couldn't pull off a miracle by holing the next. 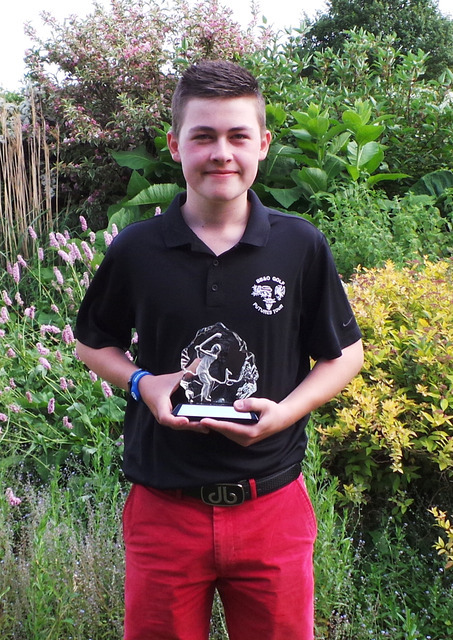 Michael also took the Under 16s Trophy by a massive 11 shots and Jack Broome (Frilford Heath) picked up the Handicap Trophy by 1 shot from Gus Davidson (Buckingham). 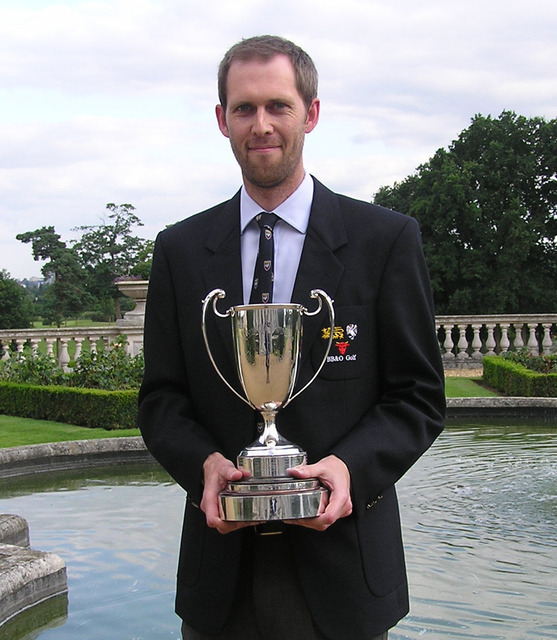 The 84th Amateur Championship was played at Stoke Park on Friday 9th & Saturday 10th August. The format for this Championship is that the top 48 (based on exact handicap) are entered automatically and there are 24 qualifiers from the Penfold Trophy. Tom Lawson from the host Club led after the first day after two very solid rounds as others struggled with some tricky pin positions. His 71 and 72 gave him a two shot advantage over Lindsey-Ben Woolford (Woburn) and by another 2 from Sam Whitehead (Woburn). Ashley Watkins (East Berkshire), Carl Corbin (Stoke Park) and Craig Buttivant (Gerrards Cross) were also in with a good chance with 36 holes to go and Round 3 normal produces a re-shuffle of the pack making the last round quite exciting. As predicted the 3rd Round saw the best golf of the Championship and four players broke 70 and Ashley Watkins took the lead on 216 after a 68, which was matched by Jean-Michel Hall (Woburn) who moved up to second place. Craig Buttivant also broke 70 and he and Tom Lawson were tied 3rd on 218 and the only other serious contender was Tom Wilde on 219 after a 69. 'Beware the injured golfer' is the old adage and the 4th Round proved no exception. Lawson had been carrying a very long (tall) standing (excuse the pun) back problem and there was some doubt that he would make it through 72 holes. He seemed to make light of the problem and with huge hitting made mincemeat of some of the long holes at Stoke Park. He was 2 under par through 15 holes and his nearest challengers of Watkins and Buttivant were 3 and 4 shots back with 3 to play. Pars at all three of the closing holes were good enough for a 3 shot, win to claim his 4th Title, over past County Captain Craig Buttivant who birdied the last to pip Ashley Watkins in to 3rd spot. This was played at Studley Wood Golf Club on 30th May. Our Team of 6 players were: Alex Buckner (Bearwood Lakes), George Gardner (Castle Royle), Chris Little (Frilford Heath), Louie Moore (Beaconsfield), Alex Nicholls (Goring & Streatley) and Tim Shin (Castle Royle). The format is 5 scores from 6 to count from each round. A great performance in the morning saw us 8 ahead of Essex and 11 ahead of defending Champions Hampshire. The afternoon was not quite as good but we still looked like winning until the 2 Hampshire England Internationals both produced 5 under par rounds of 68. Two great scores that made all the difference and we lost out by just 2 shots. A terrific effort from our young side and something we can build on for next year. This was played at Sheringham on 14th & 15th May. The format is 5 scores from 6 to count and our team was Ashley Brewer (Denham), David Niven (Newbury & Crookham), Bob Lander (The Lambourne), Phil Sewell (Castle Royle), Adrian Donkersley (Gerrards Cross), David Lane (Goring & Streatley). A very disappointing Championship as we shared the lead after the first round and were the only team to record all 6 scores in the 70s. Day 2 couldn’t have more in contrast as none of the players managed to break 80 and we slipped from 1st to 3rd and let another one slip from our grasp. This was played at South Beds Golf Club on Saturday 13th July. In this one, all 6 scores count and our team was Carl Corbin (Stoke Park), James Foster (Newbury & Crookham), John Kemp (Woburn), David Langley(Castle Royle), Andrew Taylor (Woburn), Tom Wilde (Castle Royle). Once again we held a healthy lead after the 1st round and really thought we could break our duck this year. Not to be - and only 1 County had a higher score than us in the afternoon and we slipped back to 3rd spot. What a very disappointing series of County Qualifying events this year. To lead in all 3 and not convert any of them is really not acceptable. Played at Dunstable Downs on 19th & 20th August. This event involves 9 Counties playing a series of round robin matches with the title decided on match points and in cases of a tie, on game points. Each year 2 Counties are relegated and we welcomed back Bedfordshire and Norfolk for this event, with Middlesex and Suffolk standing down. This is a superb competition that brings together some of the best Junior players in the South East of England in a format that is focused on team playing. We still have a very young side but had hopes of a good performance. The competition was tough and there were no easy matches in the round robin format. We played eight matches - each with three pairings and were selecting from a team of eight players in total. It was nip and tuck all the way through. We had good victories in the first morning session over Kent and Hampshire with team captain Chris Little and partner Tim Shin in sparkling form and winning convincingly. More points from George Gardner and Alex Nicholls followed and secured the victories. The afternoon was a tougher affair where we incurred our only loss against Sussex and a half with Essex. That left us in fourth place after day one. Day two started with the same sunny skies and calm conditions that we had on the previous day and we knew we needed to take maximum points from our four matches if we were to regain out title from two years ago. Once again, Little and Shin went out first and finished off both Bedfordshire and Norfolk early and were in having a well-earned rest after two hours or so. The new pairing of Michael East and Alex Buckner also beat Norfolk comfortably but were narrowly beaten on the 18th by Bedfordshire after finding two bunkers. That left Gardner and Nicholls to scrape a half, also on the 18th with a nicely crafted par on the difficult short hole. Having dropped a point in the morning against a stubborn Bedfordshire we absolutely had to beat two of the traditionally toughest teams, Surrey and Hertfordshire, in the afternoon. All the teams were tired after two days in the sun and a very tough, hilly walking course. Little and Shin who had played all four matches together beat Surrey and halved with Hertfordshire whilst Alex Buckner and Louie Moore turned round a two hole deficit with three to play. At the 18th after a booming drive from Moore, Buckner hit his 100 yard uphill pitch to a few inches and sealed an important win against Hertfordshire. With the pressure on, the new pairing of George Gardner and Patrick Bart were one up on each of their opponents coming down the last and knowing that they needed two wins to give us a chance of winning the tournament. Gardner's drive found the centre of the fairway and a neat pitch from Bart left a twenty footer for par. Playing it safe, Gardner left it three feet short but the confident Bart rolled it in for a double win in front of a substantial and appreciative gallery. So had we done enough? Well sadly, Sussex the overnight leaders, had scored the same as us on the second day and took a well deserved victory overall by the narrowest of one point margins over us. But our lads did brilliantly and with exception of Tim Shin, who will leave the Juniors this year, they will all be available for selection next year when we go to Felixstowe to challenge for the title again. Well done to the whole team who all played their part with everyone scoring points in their matches.